Every year, Gameological looks back at the new games we played over the last 12 months, and picks a few of our very favorites to talk about. We call that tradition Games We Liked, and you can find 2016’s lists here and here. Just as important is this annual follow-up: Games You Liked, a special edition of Keyboard Geniuses where readers get a chance to tell us why they love their favorite games of the year. We’ve culled the list down to seven responses, but there were a ton of great reader entries this year, and we implore to go check out the full comments sections for even more GOTY goodness. I liked The Witness because it created a language all its own. 2016 was a year of games encouraging players to meet them halfway rather than gently easing players into their worlds: Dark Souls III continued its commitment to opaque mechanics and lore; XCOM 2 upended the few player-friendly trappings of its predecessor in favor of guerrilla warfare, and Hyper Light Drifter avoided offering any text to help players make sense of its world. The most compelling example of this trend was The Witness. Jonathan Blow began development by exploring how many permutations of simple line-drawing puzzles could be created, then wordlessly conveyed this exploration to players through a combination of deliberate “level design” and incrementally increasing puzzles. Bit by bit, the player learns a new language—even the most rudimentary mechanics of completing a puzzle are hidden until players discover, in the game’s celebrated “eureka moments,” what is expected of them. It is a fascinating experiment, and one that almost casts the player back to the moments when he or she was learning a first language, or how to solve math equations. Blow and his team crafted a masterpiece with this, and I’m lucky to have experienced it with no preconceived notions. I liked Dishonored 2 because its biggest act of stealth is slipping in progressive themes and a diverse cast. It features a strongly women-driven narrative—especially playing if you’re playing as Emily (as the game sort of pushes you to do)—which is boils down to two women competing for power and grappling with the legacy of Jessamine, the former ruler. Women occupy positions of prestige and power at all levels of society in Karnaca, from science to military to streetgangs. Arkane really turned it around on that front after the first Dishonored, which really gave women short shrift, especially the non-lethal solution to dealing with Lady Boyle. Yes, it’s a game with an awesome clockwork mansion mission and a mission that allows you to jump between past and present seamlessly, and it’s a game with a huge toybox and pushes you to keep trying new things. It’s a great game on a technical and design level, but its themes and diversity are what stay with me. I liked Overcooked because it’s a simple game that let players complicate things for themselves. It’s a local multiplayer cooking game where all of your commands are contained to two buttons: “pick up/drop” and “chop.” Ghost Town Games recognized that they didn’t need any other buttons. The result is accessible to even the gaming agnostics among us, and where the challenge comes from how well you communicate and work together with the people on the couch next to you. We’ve gotten games of four going with two veteran players, an initiate, and one person who picks up a controller maybe twice a year, and everyone had a blast. The genius of Overcooked is the way kitchen layouts and scoring encourage cooperation. Sure, you could let each player run off on their own to fill orders individually, but the orders will come out slow and you might not earn even one star. If your team wants to go for three stars, you have to break up the cooking process into discrete tasks and make hand-offs on the fly. The most efficient team has to take risks and complicate things in order to crank out more orders, and that’s when Overcooked shines. It’s surprising how much fun it is to slide a supreme pizza across the counter just before the buzzer, each ingredient coming from a different cook. It’s even more fun when things fall apart, and your friends are howling because you missed your mark and threw both yourself and a finished bowl of soup in the lake. I liked 1979 Revolution: Black Friday because it taught me that remaining politically neutral can only work for so long, and eventually, you have to choose a side. This adventure game puts you in the role of a photographer during the Iranian Revolution of 1979, where the citizens were in the midst of choosing life under a ruthless dictator or under what became an equally (if not more) oppressive regime with the rise of the Ayatollah Khomeini. It showed that the political spectrum is not so much a line as it is a full circle—the furthest ends of Left and Right wrap around to look nearly identical from the standpoint of the citizens. If those that fail to learn from history are doomed to repeat it, then this game is important to everyone, especially now. In the news, politics and government seem to be increasingly misunderstood, marginalized, and undermined through the guise of both “liberal” or “conservative” principles, and I see a slippery slope that could lead us into exactly the same situation as what happened in Iran—out of the frying pan and into the fire. The question “which side do you choose?” becomes a lot more difficult when the spectrum shifts orthogonal to your viewpoint. No book or movie could have challenged me to ponder this situation on such a personal level, and the timing of it could not have been more appropriate. I liked The Last Guardian because I have, and have always had, a dog. Okay, that’s not the only reason (and there will be minor spoilers here), but that was a large reason. I’ve played both Ico and Shadow Of The Colossus several times through, and I’ve been waiting for this third game since its first announcement something like a decade ago. The “Soulsborne” games’ penchant to place you in a lived-in world and stubbornly refuse to explain everything carried over into The Last Guardian. You know there’s a story here, but you can’t really be sure what it is. But really, Trico is both an actual pet and wish-fulfillment for anyone who has ever had a pet. The beast is stubborn but loyal, distracted but reliable. It’s irrational fear of normal architecture is familiar to anyone who has seen their pet (as I have) freak out when it nears a sewer drain. But you can also ride Trico, and it saves your life on more than one occasion. Like rescuing a dog, Trico is at first uneasy around you, but then forms a real bond as you spend more time together. And most importantly, when it comes time to say goodbye, you feel real loss. But unlike actual pets, you can start the game over and hang out with Trico again after that goodbye. I don’t know any pet owner that would turn down a chance to spend another day with a pet they lost. “This must be what Woodstock was like,” I thought to myself, as my data plan and phone battery began to complain. It might not have lasted long, but it sure was beautiful. because it gave me the freedom to indulge in the most ridiculous acts I could think of. Hitman consists of six maps spanning the globe, each containing the tools for Agent 47 to manipulate the hundreds of characters performing their actions like clockwork, all with the end goal of eliminating the assassination targets found on each map. Sure, you could run up to a target and shoot them in the face and run off, but where would the fun be in that? Wouldn’t it be much more satisfying to drop a chandelier on their head, or drown them in a toilet, or manipulate events such that they bring about their own demise, allowing you to slip away completely unnoticed in the manner of a true silent assassin? 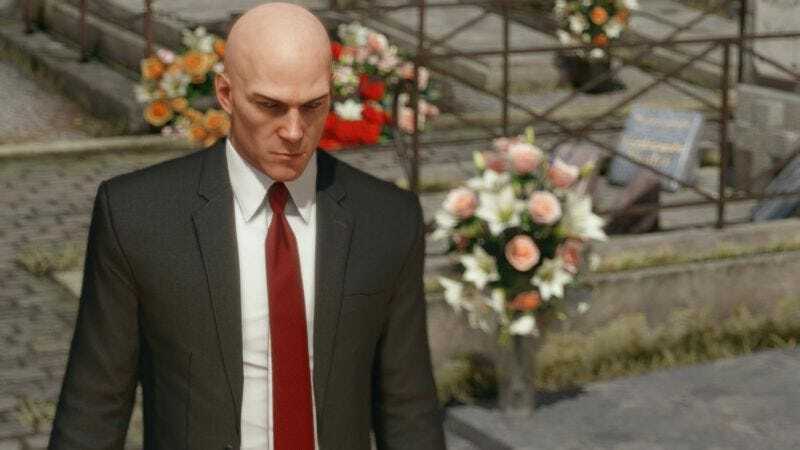 There are dozens of both simple and elaborate ways to eliminate each target, and that’s just the tip of the Hitman iceberg. There’s also elusive targets, escalation missions, and killing every single character on the map if you’re so inclined. And what other game lets you stalk your prey dressed as a male model, or a priest, or even Santa Claus? No other game of 2016 provided me with as much entertainment as Htiman. That does it for 2016, Gameologerinos. From the very bottom of our hearts, we want to thank you for all your support and scintillating conversations. You’re the best community around, and Gameological wouldn’t be the same without you. Happy New Year!